It's been a tough week with many ideas on my mind for the next tutorial. Then I suddenly landed on a great spot of Flickr group: Vectortuts Group Pool. My eyes scanned down on some new submissions and this typographic poster design has caught my attention. The typeface poster was designed by a graphic designer from the UK, Simon Page. What's so special about this poster is that, Simon Page has used his own typeface creation, called Rolet. It will be available soon in vector form. Vector typeface has became widely used by many designers recently to present designs that has POP feel and contemporary or maybe even to create an extreme design look. Rolet is an interesting typeface design which has some kind of 2D layered shapes that are twisted, and the twist produced a smart 3D typeface in overall look. Just interesting! 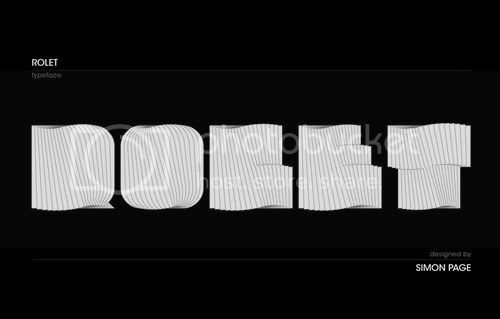 Take a sneak peep on this Rolet Typeface Design. This morning I surfed down the net to find pencil sketch effect tutorials. There are obviously lots of different techniques to produce this kind of effect into a photo. I followed several tuts, to compare the results and I felt like I needed to find the very quick one, yet it should have great result too. So, I came across this (relatively old) tutorial post at Jeff Flowers's.com. Written by Jeff Flowers himself :). He wrote a smart tutorial which is very easy to follow about "How To Turn A Photo Into A Sketch". I decided to create a set of photoshop action based on this step by step tutorial. In Step 3, Jeff Flowers set the radius blur into 6px (Filter » Blur » Gaussian Blur), but in this photoshop action, I set it into 15px. Jeff has also noted that: this all depends on your image. Even you will have instant graphic effect using this photoshop action set in a blink of an eye, I think you would still need to understand how this effect is produced. 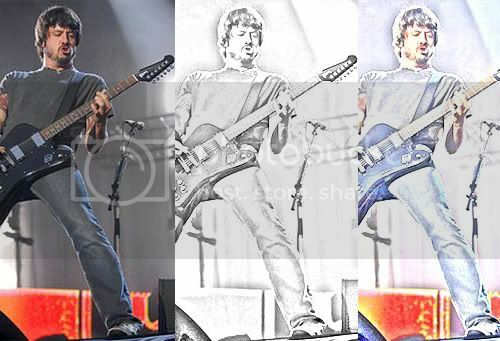 Because your image contrast will take part on delivering a great result of pencil sketch effect. Sometimes you will have to create this graphic effect from scratch, instead of using automatic photoshop action. Just hit the play button on two different file of images, and see the result within few seconds. If you don't know what photoshop action is and how to install it, you can read the details at: Graphic Identity Photoshop Action tutorial before you start. Hello I’m here again. Sorry for leaving you for the past couple of months. 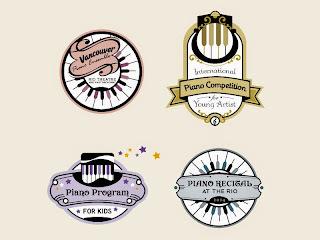 I was terribly busy and hardly find any chance to update Graphic Identity blog. I wish you guys still be here for more. I really appreciate your visits somehow, and will love to hear any comments or questions on my post. I finally managed to create a set of gradient freebie. There are 100 gradients included and they're free to download for personal and commercial uses. I've created random solid colors (no particular style or whatsoever). Because I'd like to experimet a bit, and perhaps next time I could come out with more spesific gradient styles. 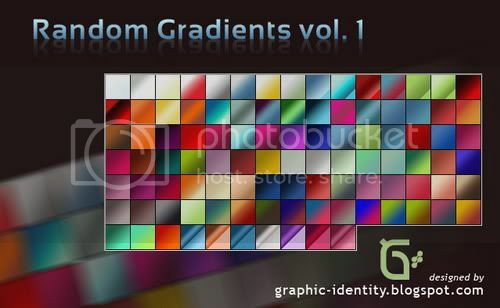 You can read: How to install Photoshop Gradients Tutorial, If you don't know how to install a .GRD file to your system. I would like to remind you that all of my 'Free Design Box' files are FREE (for personal or commercial use). But after I found that my previous Photoshop brushes set was hijacked before, please read: Legal Usage to employ Graphic Identity's 'Free Design Box' files.